Your webmaster had the pleasure of carrying out scientific experiments on octopus at the Stazione Zoologica at Naples during the summer of 1977. This was in collaboration with the famous English zoologist and neurophysiologist J.Z. Young (1907-1997) who discovered the squid giant axon and the corresponding squid giant synapse. He worked for many summers pre-and post-war at the Stazione Zoologica and was made an honorary citizen of Naples in 1991. The aquarium is open to the public and worth a look when you're enjoying the Naples waterfront. 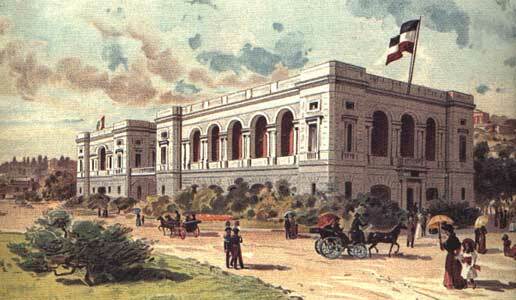 The Stazione Zoologica has been founded in 1872 by the German zoologist Anton Dohrn (1840-1909). In Jena, Dohrn was a student of Ernst Haeckel who introduced him to Darwinism. Dohrn thought of the Napoli institute as a pilot centre of a worldwide network of research facilities for studies in marine biology. The Naples Aquarium is a unique example of a nineteenth century research station that has continued to operate in its original premises right up to the present day. Its sombre, almost austere atmosphere embodies the age in which it was founded and contemporary taste in both architecture and criteria for exhibiting marine life, making it a monument of extraordinary historical importance. It was opened to the public on January 12th, 1874, when elsewhere in Europe comparable institutions were only just beginning to be conceived. During the second half of the nineteenth century the increasing collaboration between naturalists and physical chemists led to the discovery of a way of keeping marine species alive in captivity. At the same time other, nonscientific factors contributed to the growth of interest in aquariums, such as the abolition of the exorbitant tax on glass and the expansion of the railway network. As early as 1867, Dohrn had dreamed of opening an institute on the seafront for the study of marine biology. He was more interested in the biological features of marine life than in anatomical or morphological characteristics, and his field trips round the shores of the Mediterranean convinced him of the necessity of being able to keep captured specimens alive. On a visit to Messina in 1868 he took with him a new piece of equipment in the shape of a portable aquarium, and once this had proved its worth he decided to install a number of such tanks in a building beside the sea and make them available to marine biologist. Dohrn was convinced that this would greatly benefit research, and planned to finance the scientific side of the zoological station by opening the aquarium to the public and charging for admission. Naples, at that time still recently the capital of the Kingdom of the Two Sicilies, was a sufficiently important centre of tourism and commerce to ensure keen interest and support for such a novelty. An English engineer, Alfred Lloyd, was commissioned to design the new institute. In his London premises in Portland Road, he had invented a system for recycling water which made it possible to keep specimens in a tank over a long period of time without having to change the water. Taking advantage of the site of the new Naples aquarium, Lloyd designed a system for pumping water into the cisterns directly from the sea, without any need of filtering. Such a method of circulation was an immediate success and was imitated in many other aquariums, including the one in Monte Carlo. The Naples aquarium still uses this "semi-closed" system, in which the water is pumped from two large underground cisterns into the tanks and then flows back down, during which time about one third of the volume of water is renewed. The water is drawn from the Bay of Naples at a point 300 m offshore and 11 m deep, and is left to decant in a large tank before going into the cisterns. The twenty three tanks on display, ranging in capacity from 250 litres to 69,000 litres, use volcanic rocks to create a natural setting and are chiefly illuminated by daylight from the skylights in the roof. All the specimens come from the Bay of Naples, which in spite of pollution is still one of the richest breeding grounds of marine life. The tanks of the Gorgonie, a veritable underwater flower garden, and the Astroides, where the various polyps thrive on a daily diet specially prepared in a liquidiser, are both particularly beautiful. Roman amphorae where moray eels and crabs lurk in the gloom and Neapolitan water jars wreathed in Spirographis add to the unique atmosphere of this aquarium. Examples of all indigenous species can generally be seen, within the limits of the display capacity. The common fauna has no particular difficulty in getting acclimatised in a confined space, while to more delicate specimens which generally do not survive in captivity are looked after with particular care. Over the last few years the aquarium of the Naples Zoological Station has enhanced its status as a unique historical monument and collection of marine life by providing a full range of educational, ecological and research activities which ensure its place among the world's most up-to-date aquariums.